Here’s how to draw a flower step by step. You may learn by drawing along with this video, or practicing with the pictures. Drawing a flower can be easy. You just need to focus and draw along, and before you know it you can draw a flower! If you’ve been longing to draw a cherry tree, well now you can! Drawing takes a lot of imagination and effort even for experts. So in order to prevent your drawing from looking amateurish, you need to concentrate and forget about everything else for a while. 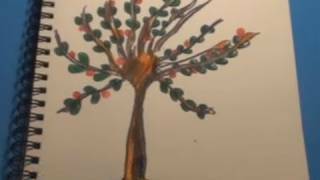 Here, it will only take you a couple of minutes to learn how to draw a cherry tree on your own, and this can be made super possible by following the video while you draw along. Leave your snack on the table (though I recommend taking a sip of orange juice once in a while) during this drawing. Good luck, and let me know how many minutes it took you to finish learning! Drawing a lily flower is fun and easy. Here is a step-by-step guide on how to easily draw a lily flower; you should draw along while watching the video, and soon you will master how to draw a lily flower. Draw the star-shaped “leaves.” See video above that shows you how to do this. Draw the pollens (I don’t know what to call those) in the middle. Draw the bottom of the lily flower. Draw the stem, and you’re done! Following the video and drawing along while watching it will quickly increase your skills and you’ll be able to draw a lily flower in no time! People usually draw a rose by starting from a heart shape just to make the process seem romantic and all. Well, I find that very funny and entertaining rather, and I don’t fully accept or reject it. Although some people can actually learn how to draw a rose faster by using that technique, a lot of people actually fail on it. I’m sorry for bursting our bubble, my friend, but drawing a rose by starting off with a heart isn’t recommended and won’t actually help beginners learn faster, which is why I have put together a video for you to begin and finish with. If you’re tired of those videos that start with a heart making you land nowhere, don’t worry! This video will help you when you watch it and draw. Good luck, and I hope you learn how to draw a rose under an hour!